You know the saying, "no news is good news"? Well, in the freelance illustration junket that isn't necessarily the case...EXCEPT in my case right now. I've been keeping busy (though there is always room for more) on various projects that haven't yet been published so I am not yet able to share. So, aside from the odd freelance job, what have I been up to? Well, since June I've been working part time at my VERY FAVORITE STORE IN THE WORLD. EVER. That is...Paper Source. I've been a Paper Source fan ever since the shop opened on the Plaza in Kansas City, so when I heard that they were opening up two new locations in Manhattan, I said, "Sign me up!" And fortunately, the kind people at Paper Source did! 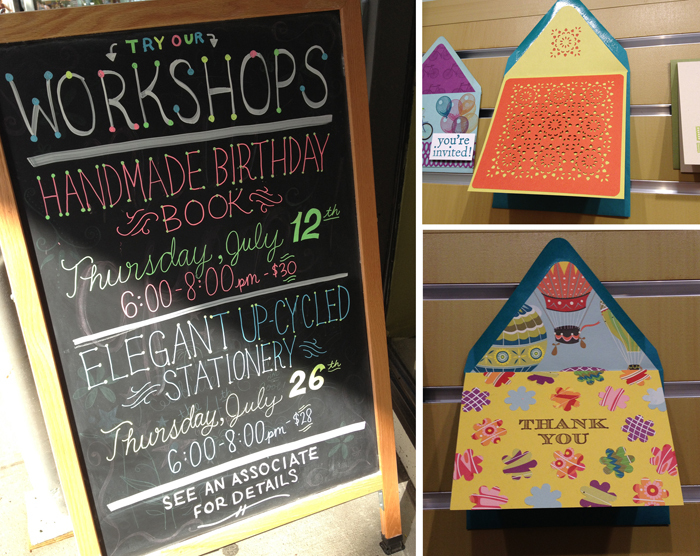 Most of my job responsibilities are the ones you'd expect working in a shop, but SOMETIMES I get to do some really fun things like make samples using all the cool tools we sells, show nice women how to use a heat embossing tool, and, my very favorite, make chalkboard signs for the sidewalk. Life's simple pleasures, but ain't it great when you can work for a company you truly love and believe in? In addition to my regular gig at Paper Source, I also have a new regular part time gig doing freelance design/illustration and hand lettering for a sweet little design studio in Chelsea called Petite Alma. Petite Alma primarily designs cards, invitations and announcements that you can purchase on Tiny Prints and Wedding Paper Divas. The owner, Kirby, is a great gal and is really letting me take on projects in which I can utilize my own style which is a first for me in a design job. Today is day 2 of this regular gig (though I've been freelancing for the past month), so stay tuned for updates!